Opening Day, a day for happiness, a day that signifies that summer is on its way, a day that everyone is in first place, a day that every team still has a chance, a day of sadness for me. As much as I enjoy spending this day with my wife and friends hanging out at the ball park, it’s another opening day without my father. It’s now been over seven years since I lost my dad to cancer and not a day goes by that I don’t think about him, but this day is especially tough for me as we shared the bond of baseball together. As a matter of fact it’s so tough that I had to write this two weeks prior to opening day six years ago. To further add on to the story… baseball will always cross generations and the picture below was from Beckett’s first Tiger game earlier in the 2013 season. We haven’t been back since, however this year is surely to include a game or two with B. 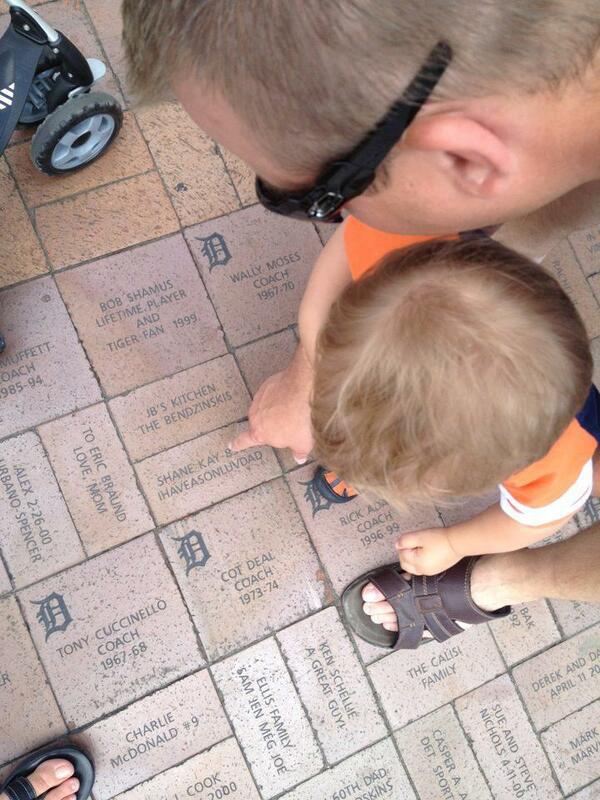 By the way, that is a brick at Comerica and the first words my dad said when I was born (“I have a son”). Reblogged this on Sons of '84.